Hello! 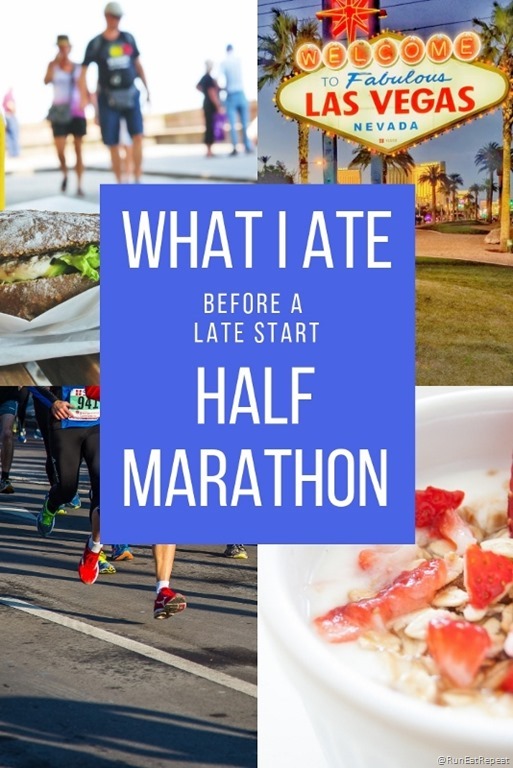 Today I’m sharing what I ate in a day – and not just any day… what I ate before the half marathon that started in the afternoon. Fueling for a night race can be really challenging! And every year I get questions on how to fuel up before this afternoon race and similar questions about relay races. So I put together a video documenting thoughts on what to eat and drink before running later in the day. 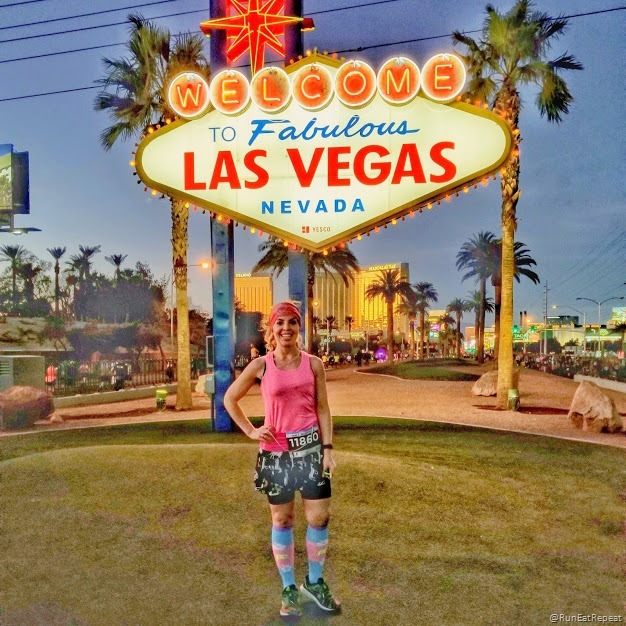 Let me know when running or fuel topic you want me to cover in the next post! But before that let’s talk about the race! 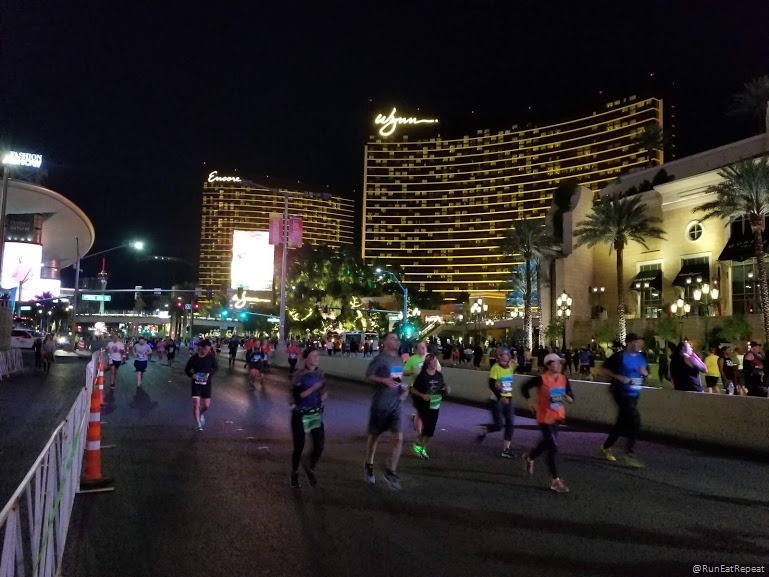 This race is also known as Strip At Night – because runners get to run down Las Vegas Blvd under all the casino lights at night. 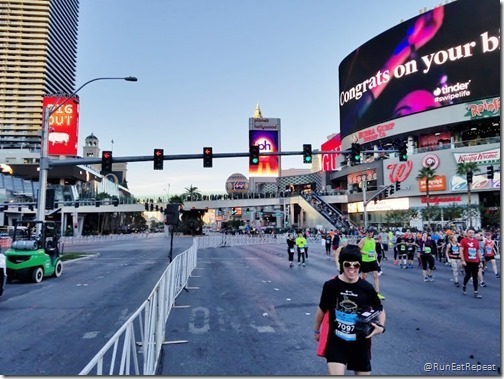 They only close the strip twice a year (the other time is New Year’s Eve) so it’s a really big deal! 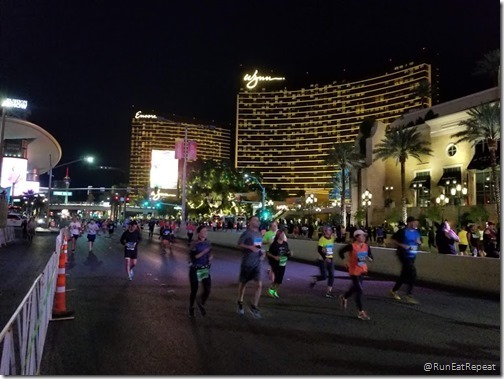 Run down Las Vegas Blvd – tons of crowds, lights. Live Music on the Course. 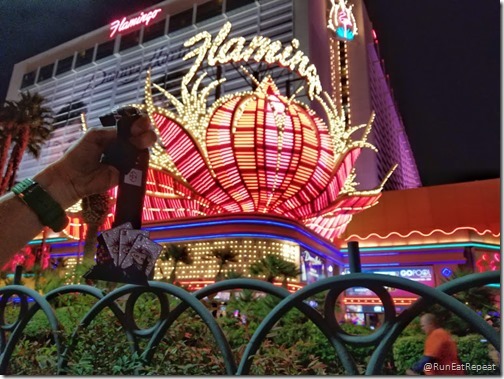 Elvis running (multiple Elvises… Elvi?). You can get married DURING the race. Afternoon race start. 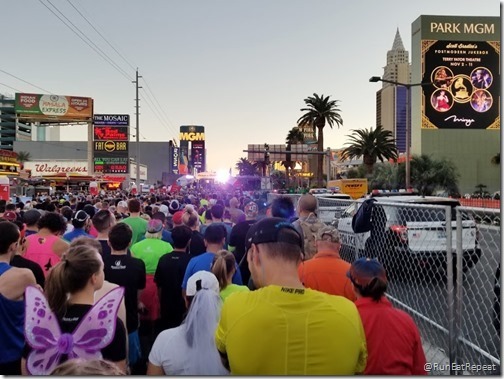 The 10K, half marathon and marathon start in the afternoon. Dark. – the late start means you end up running after the sun goes down. With the time change it feels late so you get the full effect of the casino lights. 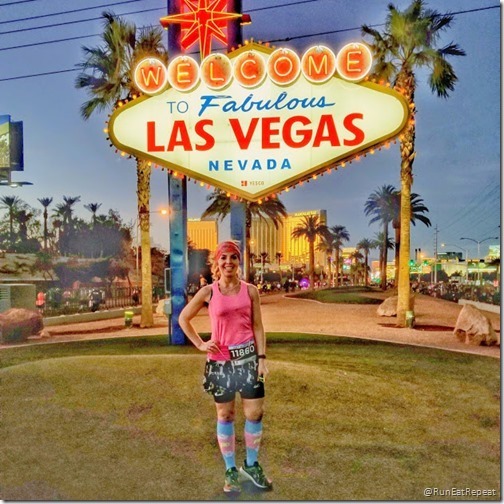 Run by the famous Las Vegas sign! 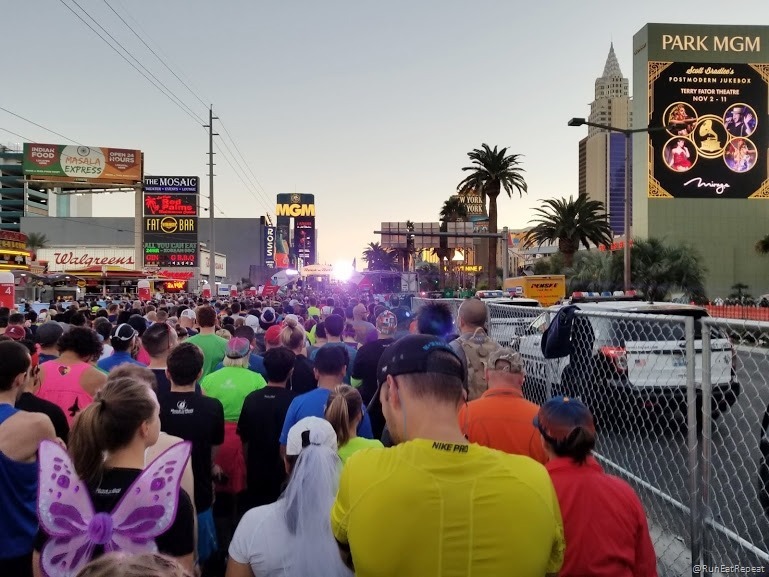 People come from all around the US and the world to visit Las Vegas and run the race! So many followers messaged saying they say me or said ‘Hi!’. 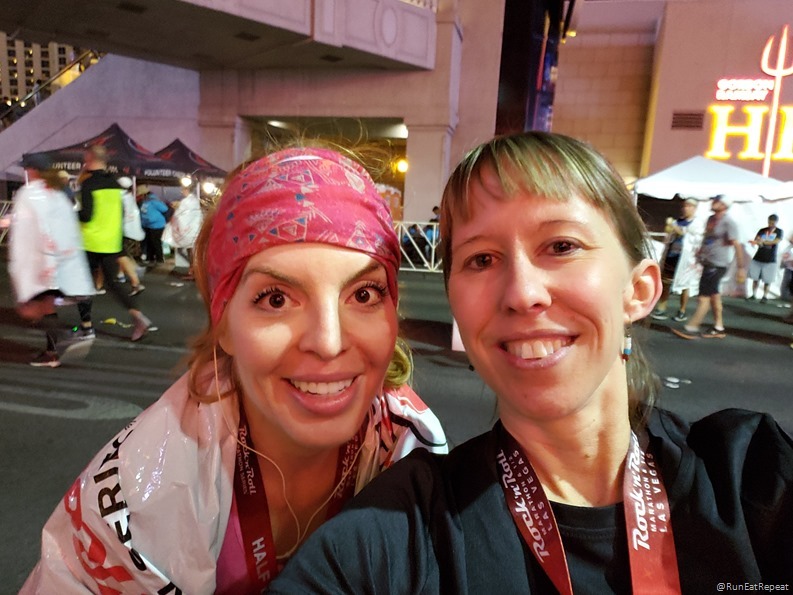 And I got to run with a runner from Georgia, Leslie! It’s so fun to meet someone and immediately feel like you’re running buddies. 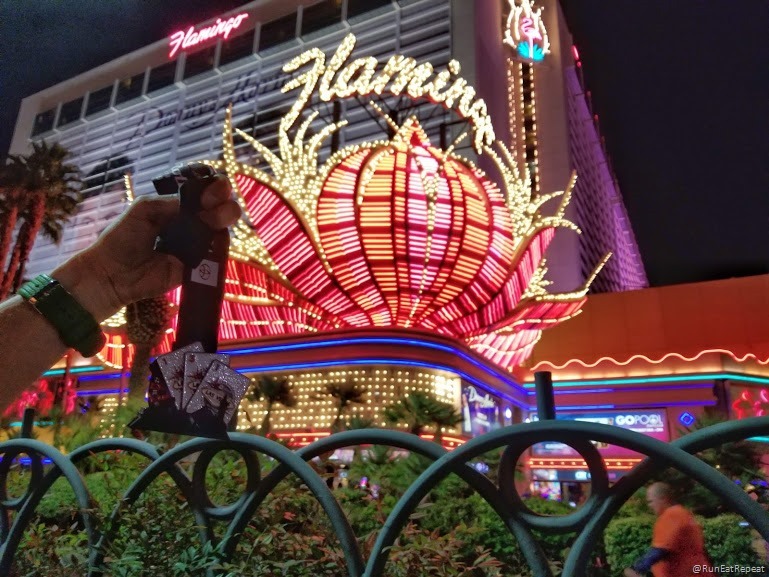 The race ended near the Flamingo Hotel. I tried to take a picture of the race medal in front of the shiny lights but it’s hard to compete! 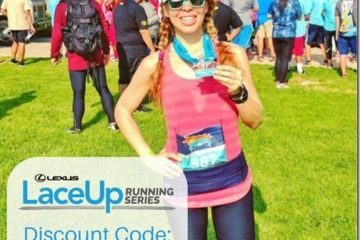 My run: I’m a morning runner all the way so it’s hard for me to run in the afternoon. But the energy and location makes it easy to get excited and want to get out and go. 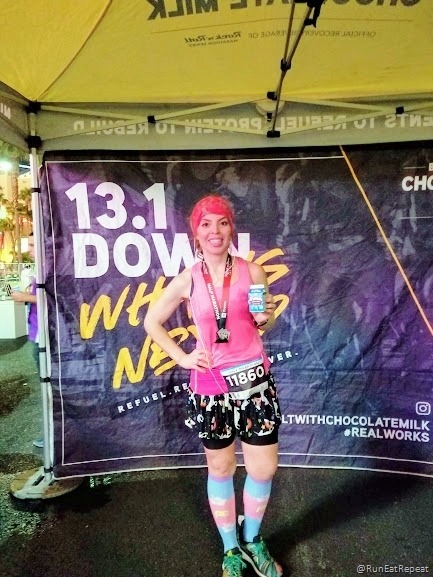 And right after the race I was excited to see one of my favorite ways to refuel –> Chocolate Milk! Boom. 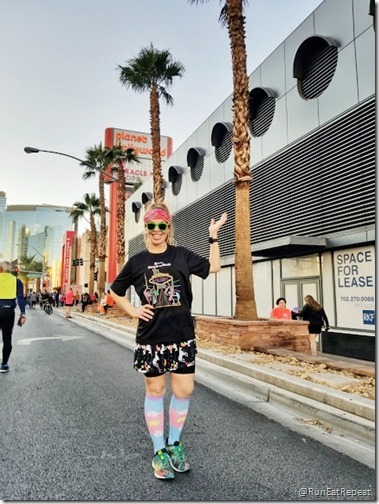 The RnR Las Vegas Half Marathon starts in the early evening – but I run in the morning when I’m training! So I’m sharing what I ate before the race to make sure I was fueled up – but didn’t have any stomach issues. This can be hard to navigate so make sure you are practicing what you’ll eat and drink before your race during training. Do what’s best for your body and the only way to know that is to listen, pay attention, respect your body and take notes on your training runs and recover. The #1 rule of race day is – Never try anything new on race day. 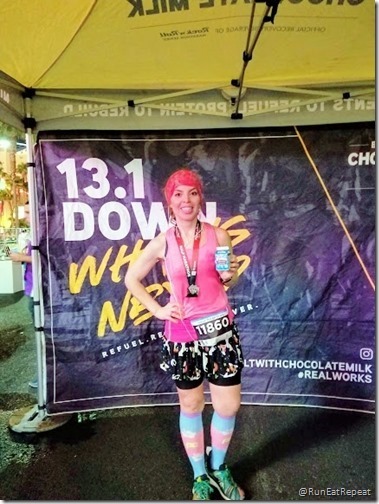 So don’t eat, drink, wear, listen, try… anything new when you’re getting ready for race day or on race day. 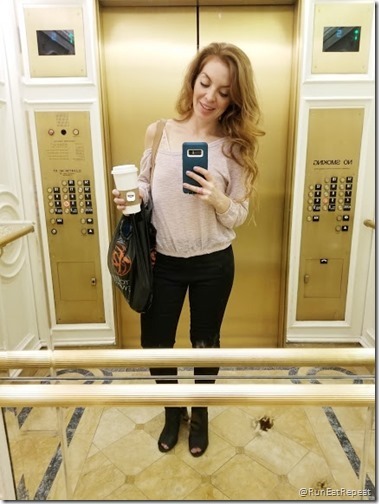 And my post on the hotel and start of race weekend is up now here. Nuun –> Drink tabs with electrolytes and some have caffeine and vitamins. Keep it simple and similar to your usual pre-run food. It’s okay to eat breakfast type foods later in the day. 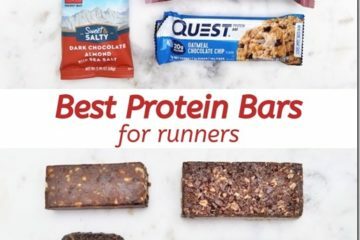 Pack snacks or buy snacks when you get to the race destination. 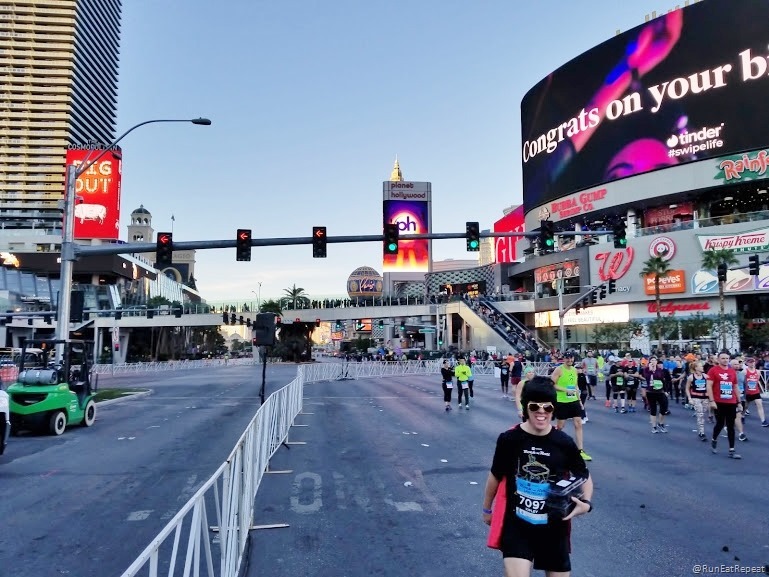 You might not want a big meal before the race – and that’s okay. But make sure you have a lot of snack options so you can graze during the day if that’s what your body needs. 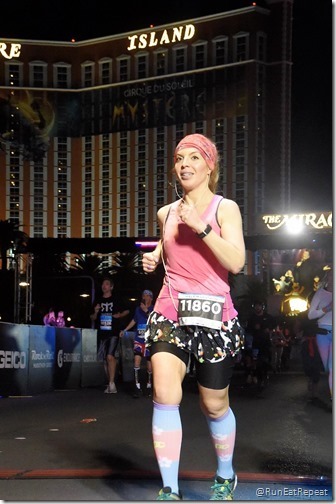 I had a discount code for the Las Vegas Races and I’m talking with the race organizers to get another one for next year. Make sure you’re subscribed to the email list to get new discount codes and sales! Leave a comment below and follow me on @RunEatRepeat on Instagram to chime in with the topics you want me to cover next! 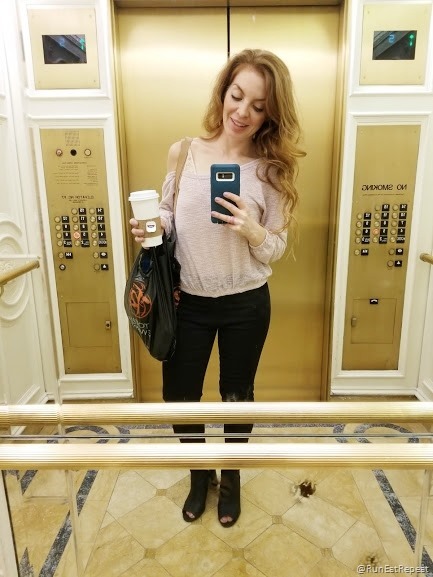 Get the latest sales, podcasts, recipes and more straight to your email!